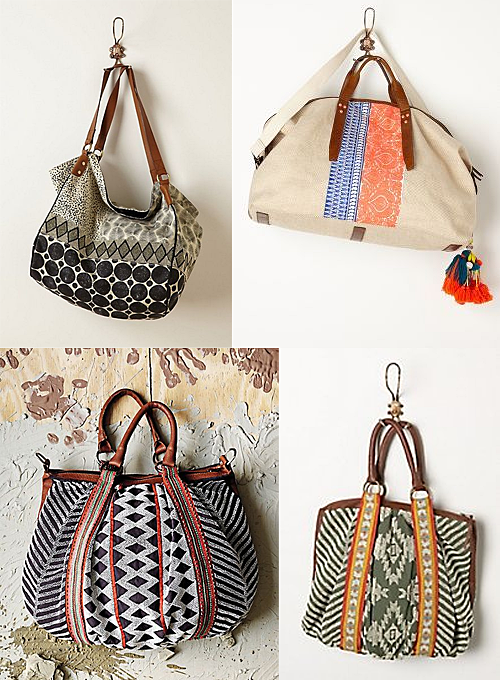 If you want to see more like these, I’ve pinned a bunch more patterned tote bags here from Anthro, Free People, Calypso St. Barth, Accessorize, etc. What I see when I look at these bags is mix ‘n matched combos of border patterns. Like border patterns from stencils. Thus, you could paint a bag with stencils. Right? And so I did. You can find blank cotton tote bags in different sizes at craft stores like JoAnn and Hobby Lobby. From the selection in my local stores, I found Hobby Lobby carries slightly thicker tote bags than JoAnn. Dharma Trading also sells them online. They’re usually available in white, beige and black. You will need to iron the tote bag before painting on it. 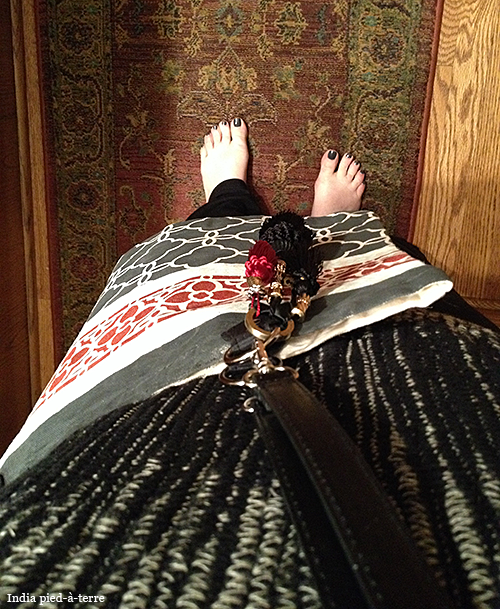 In the photo above, the bag in the front is a tote bag directly from the package; I ironed the one in the back. As you can see above, I used a different kind of paint – Benjamin Moore latex – for the light gray pattern. If you like a Benjamin Moore color, the sample pots of their paints are great for getting the small quantities you’d use for crafts. 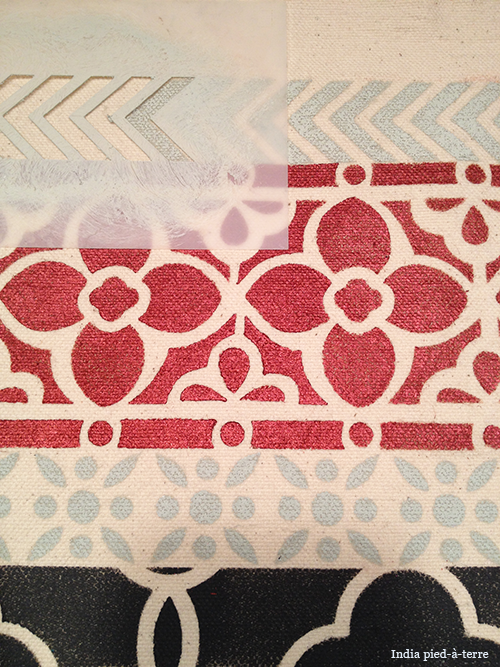 Next I painted a red pattern with Royal Design Studio Stencil Creme in Renaissance Red. These paints have a little shimmer to them which really brings the color to life. Then I painted another row of light gray paint in a different small border pattern. The final row at the top of the bag is solid Graphite. 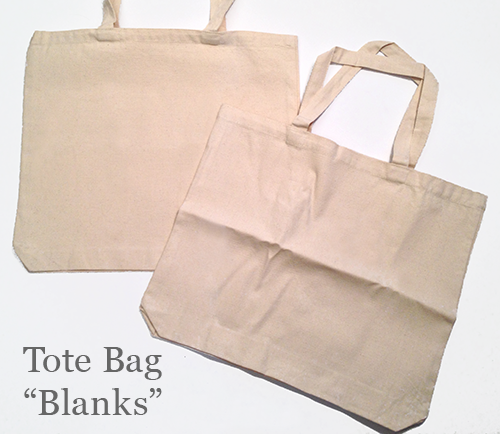 You may notice the original tote bag “blanks” had cotton canvas handles. But I wanted to dress the tote bag up, so I cut those handles off and replaced them with long cross-body handles in black faux leather. Here I am wearing it around the kitchen after finishing it! The tassel bundle is another DIY. I shared the how-to for that here. 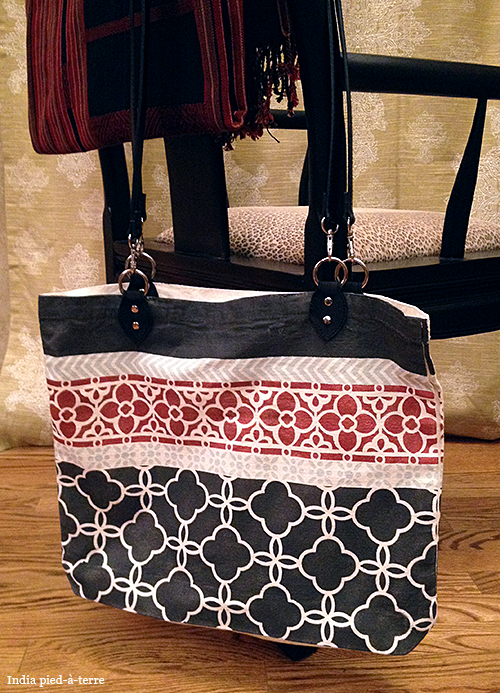 I was so thrilled with this stenciled tote bag, I wore it around the house all night. Then I just had to wear it to work the next day, to carry all my fruits and veggies in it (so it’s a great farmers market bag). I got stopped that day by colleagues who wanted to order this for themselves and as gifts for family! So … you can paint this yourself, or you can order it made for you — I’ve set up an Etsy shop with this tote bag in it. 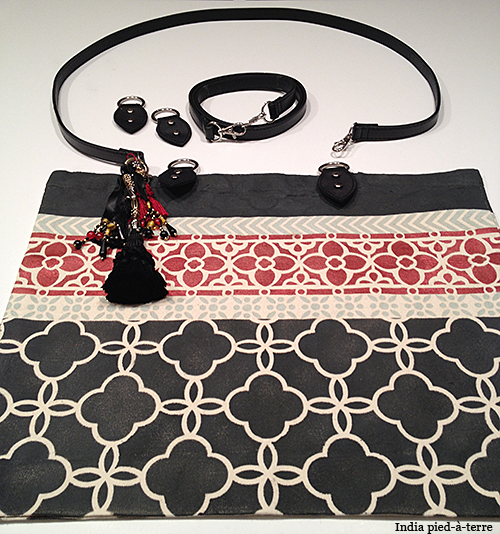 More patterned bag styles will be coming! Beautiful!! What a great idea. Thank you! :) I love your DIY serape stool, so cool! Pinned!